Arizona’s searing psychedelic punk crew Destruction Unit will bring their wild live show around North America once again this spring into early summer. The tour includes dates with Institute, Sheer Mag, Creepoid, Red Dons, Breakout and more. It hits NYC twice, first at Bushwick all ages venue Palisades on June 26, which tickets are on sale for, and then for a free Saturday afternoon show the next day at Union Pool (6/27). That one’s part of the just-announced Summer Thunder series. 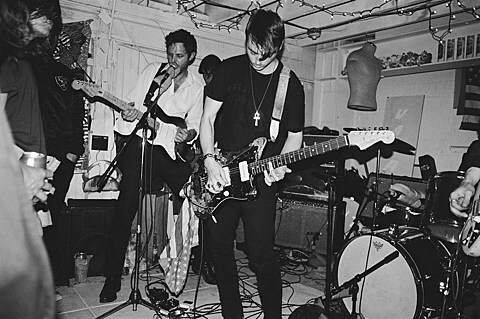 Last time Destruction Unit were in NYC they played three shows — all of them were great and all of them were different. So if you’re wondering if you should fight your hangover and see them for free the afternoon after catching the Palisades show, the answer is yes. Yes you should. Two D Unit members are also playing NYC TONIGHT (5/13) at the big Nothing Changes party with their genuinely weird Marshstepper project. Merzbow, Genesis P-Orridge, Aaron Dilloway, Prurient, and more are on that bill.